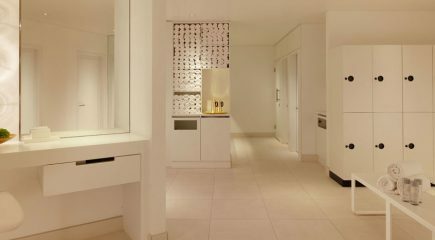 SPA Social at agua Bathhouse & Spa, Mondrian London is a new socialising concept, born from the growing wellness scene in the city. With many Londoners no longer choosing to go to bars after work and instead opting to catch up with friends during a boxing class or mindfulness session, agua Bathhouse & Spa created the evening to bring people together through health, wellness and social interaction. Drawing inspiration from the heritage and community spirit found in Roman spa culture, which formed part of the original inspiration behind the Tom Dixon-designed agua Bathhouse & Spa, SPA Social is designed to be fun and relaxing – it’s health-minded socialising for London’s cosmopolitan fitness lovers. SPA Social guests can enjoy exclusive use of agua Bathhouse & Spa, an inviting space to hang out and catch-up with friends, to the tune of the spa’s Glamrock soundtrack. Upon arrival, guests are invited to relax in agua’s subterranean spa lounge, an expansive area which boasts a custom- designed sofa filling an entire corner of the room. The spa lounge also features a striking floor-to- ceiling copper teardrop installation by Tom Dixon, designed to reflect Roman water vessels. Mudpacks are available to all SPA Social guests, which can be self-applied in agua’s steam rooms and washed off underneath the heavenly rain showers. Following this, guests can spend the rest of the evening in the spa lounge, where the air is infused with de Mamiel’s renowned Altitude Oil, a multi-tasking elixir which effectively clears the mind and boosts the immune system, perfect for busy Londoner’s who are constantly on the move. SPA Social guests will leave nourished from the inside out with a choice of three healthy food bowls from Sea Containers restaurant. SPA Social tickets also include two glasses of Thomson & Scott Skinny Prosecco per person, a flagship product in a ‘no sugar’ portfolio. The spa’s usual range of herbals teas are also available to all SPA Social guests.